Hednesford Town struck twice in the last five minutes to earn a dramatic point against fellow Play-Off hopefuls Brackley Town in a memorable midweek game at Keys Park, writes Scott Smith. The Pitmen have been known for their comebacks whilst under the leadership of Rob Smith and this game would prove no different as Hednesford managed to make it four games unbeaten at this crucial period of the season. The home side had looked lively in the opening exchanges; however they suffered a blow after just eight minutes when star midfielder Jamey Osborne was forced off with a suspected dislocated shoulder. Smith’s side continued to press, and some good interplay between Robbie Thompson-Brown and Charlie Anagho-Ntamark saw the latter unleashing a 20-yard shot which was saved low down by Turley. 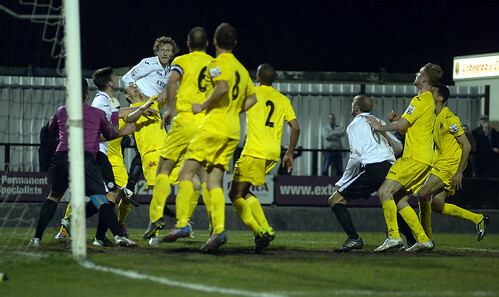 More bad news was soon to follow for Hednesford though as they fell behind in the 32nd minute. Brackley midfielder Eddie Odhiambo drove forward and he unleashed an unstoppable effort from 25-yards which found the back of the net via the underside of the crossbar. Hednesford almost drew themselves level right on the stroke of halftime, however Brackley keeper Billy Turley made an excellent save to deny Wayne Riley to keep his side ahead. The home side picked up where they left off after the break and were unlucky not to level when Marvin Johnson’s low driven cross was blasted high and wide at the back post by Thompson-Brown in the 57th minute. They would soon suffer a sucker punch though as in the 69th minute Brackley’s Glen Walker drilled home a free-kick into the bottom corner from 18-yards out to make it 2-0. The game was nearly well and truly put to bed by the visiting side in the 82nd minute as they broke clear, but Hednesford goalkeeper Dan Crane reacted quickest and was able to come out to smother the ball as David Bridges found himself through one-on-one. With Smith having made two attacking changes to try and get something from the game, one of these finally paid off in the 86th minute. The lively Johnson got down the left-hand-side and his cross was tapped home at the back post by Paul Sullivan to give Hednesford hope. The team were visibly lifted by this and soon found an equaliser as the clock ticked over into the 90th minute. A ball into the box wasn’t dealt with by Turley and his tame punch was neatly headed home by Riley to earn a share of the spoils. Hednesford now travel to Gainsborough Trinity on Saturday aiming to make it five games unbeaten in their quest for a top five finish come the end of the season.